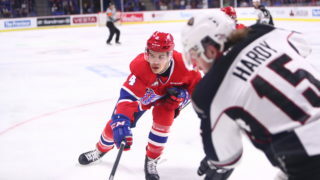 Spokane, Wash. – Hudson Elynuik scored twice, Kailer Yamamoto had a four-point game and Ty Smith scored his first career game-winning goal as the Spokane Chiefs outlasted the Seattle Thunderbirds 5-4 in overtime on Wednesday night at Spokane Arena. Seattle’s Keegan Kolesar got the scoring underway at the 7:10 mark of the first period as linemate Donovan Neuls found the Columbus Blue Jackets prospect netfront from the left circle for an easy tap in. 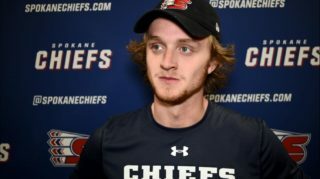 Spokane responded in kind with a shot from defenseman Tyson Helgesen just over two minutes later as the Chiefs’ captain fired one on net from the left wall. The puck snuck inside the near post past former Chief Matt Berlin, who made the start in goal for the Thunderbirds. The Chiefs continued the shot barrage against Berlin in the second period, outshooting the visiting Thunderbirds 23-4 in the period, earning Carolina Hurricanes prospect Elynuik his 13th and 14th goals of the season. Elynuik took a saucer pass from team-leading scorer Yamamoto on a shorthanded 2-on-1 opportunity, eventually putting the puck in with a backhand at the 1:05 mark to give Spokane a 2-1 lead. The assist was Yamamoto’s second of the night after extending his point streak to eight games with a helper on Helgesen’s early goal earlier in the contest. Elynuik scored his second of the night with a laser of a wrist shot from the right circle to the far post at the 4:53 mark of the middle frame, giving Spokane a 3-1 lead. Defenseman Jake Toporowski earned his first point of the season with an assist, along with his partner Dalton Hamaliuk. 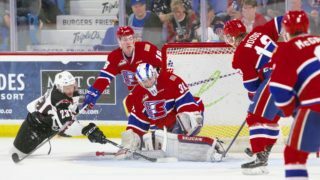 The Thunderbirds stormed right back, scoring twice in three minutes midway through the second to tie the game at three. Nolan Volcan scored his 13th of the year off assists from rookie forward Elijah Brown and defenseman Anthony Bishop at 7:41. Zack Andrusiak tallied his third goal of the year – and second with Seattle – to even the score at three apiece at the 10:14 mark of the second. 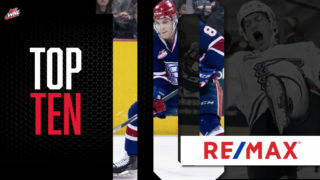 Forward Jaret Anderson-Dolan extended his own point streak to eight games after forcing a turnover in Seattle’s end before kicking the puck to the trailing Yamamoto, who sniped his 21st goal inside the top-left corner to give Spokane a 4-3 lead. Seattle once again bounced back with the tying goal as defenseman Jarret Tyszka slid in a rebound chance at the 14:13 mark off assists from Ryan Gropp and Neuls. The Chiefs prevailed in the 3-on-3 overtime, scoring on their first shot of the five-minute period as Elynuik slid the puck across Berlin to a waiting Smith, who banked it in off the left post for his second goal of the season and first game-winner. Spokane put a season-high 52 shots on goal to Seattle’s 20. 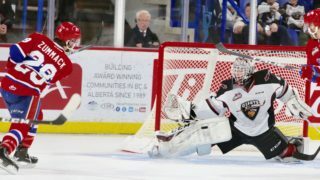 Jayden Sittler started in goal for the Chiefs and made 16 saves for the win while Berlin stopped 47 shots to earn the game’s third star. Spokane finished 0-for-2 on the power play and 4-for-4 on the penalty kill. The Chiefs remain home on Friday night for a rivalry game against the Tri-City Americans. It will be Coeur d’Alene Casino BUCK Night at the Arena as hot dogs and Coca-Cola products will be $1 all game long. 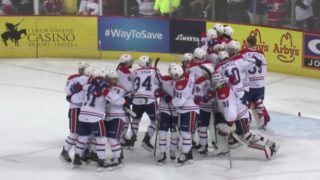 Tickets for Friday and all Chiefs home games are available in-person at the Chiefs’ Ticket Office, over the phone at 509-535-PUCK and online at ticketswest.com or spokanechiefs.com.